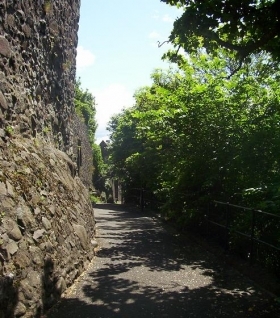 One late autumn afternoon in the early 1970s, a young mother trundled her baby’s pushchair over the crunching cascade of brittle brown leaves covering the rough pathway of the Back Walk – the pathway skirting much of the Old Town, the Auld Kirkyard and Castle Rock, and marking the line of the old Burgh Wall. Reaching the rear of Cowane’s Hospital she braced herself for the steep incline between that building and the Ladies’ Hill. As she paused she felt a most peculiar sensation, “like a finger pressing up and down the length of my back”. Turning sharply, she found herself and her babe alone upon the quickly darkening path – and lost no time in hastening homeward. Such reports here were once common – unnerving experienced attributed to encounters with the mysterious Black Lady, a ghostly nun, supposedly seeking furtive union with her secret priestly lover in some secluded nook of the Castle Rock. The Royal Commission on the Ancient and Historical Monuments of Scotland records that James II did found a Franciscan Convent in Stirling, in 1449, on grounds now occupied by the Stirling Highland Hotel – formerly the Victorian High School. Destroyed during the religious and civic strife of the 1550s the Franciscans' lands extended along the line of the Back Walk, as far as the Old Town Jail, so encounters with a surpliced figure on this leafy lane would not have been unlikely in ages past. Tales of her sinful union – and the notion that her sin and shame is so great that those who meet her gaze are unlikely ever to see the coming dawn – are terribly dramatic, but it has to be said, in fairness, that the naughty Novice’s bad habits probably owe a great deal more to the violently anti-Catholic sentiments once so rife within the town, as they do to any actual fleshly transgressions. Her story is first reported in the 1650s, when divisions between various Protestant factions were threatening to tear Scotland apart – a wall being erected within the Church of the Holy Rude to keep the warring congregations apart by the Reverend James Guthrie – and the only thing these groups loathed more than one another, was what they considered the ‘taint of Papism’. Like the Green Lady, though, the Black Lady’s legend may have much older origins. 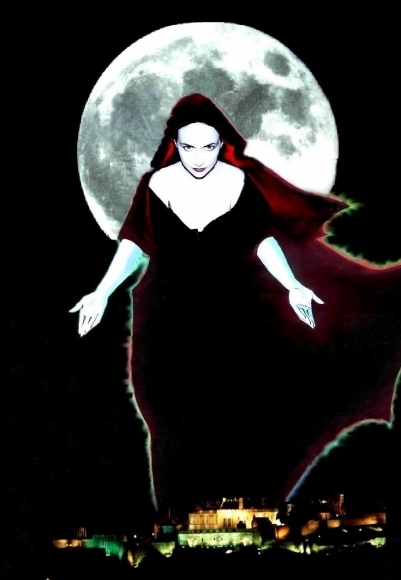 Old legends talk of the Baobhan Sith, a black-garbed seductress – almost vampiric in her habit of draining the life out of those who might be tempted by her charms, or trespass on her territory. The danger of dallying with a sinful nun may not just be Protestant propaganda, then, but a more recent riff on ancient warnings of the perils of straying from the path or righteousness!